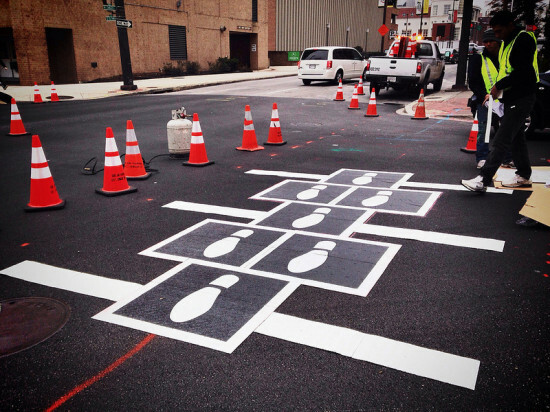 Crossing the street in Baltimore just got a lot more fun. The city has just unveiled its newest dispatch: a “hopscotch crosswalk” transforming the downtown street crossing at the corner of Eutaw and Lombard streets into an entertaining diversion for pedestrians. The project was a component of the Baltimore Office of Promotion and the Arts for the Bromo Seltzer Arts & Entertainment District’s desire in incorporate public art in various areas of the city. 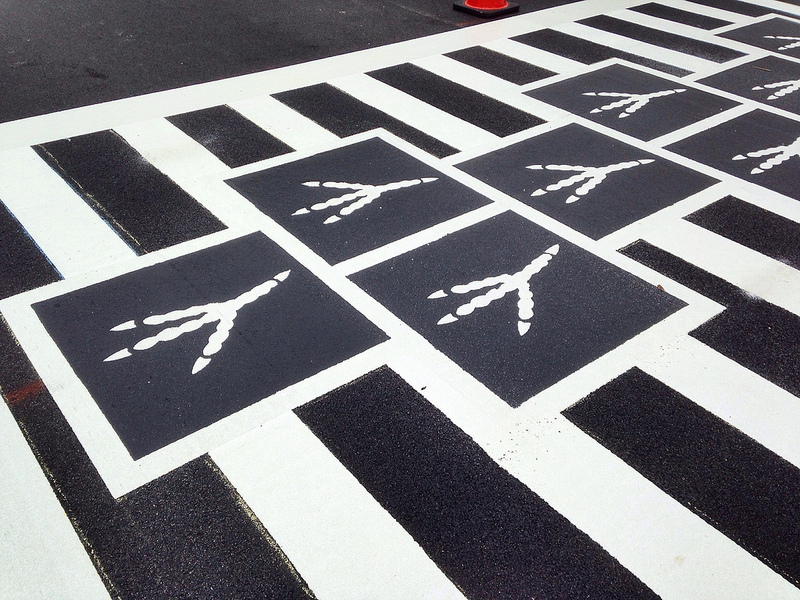 The piece is comprised of four crosswalks, each featuring a different footprint symbolizing the city’s many inhabitants. A shoe-print represents the business person, bird tracks mirror the flock of birds in the city sky, the boot portrays the labor force, and the footprint depicts the numerous artists bouncing around the city. Baltimore is one of many cities within the United States which has toyed with crosswalks by altering their main function as gateway between intersecting streets into a tangible piece of entertainment. 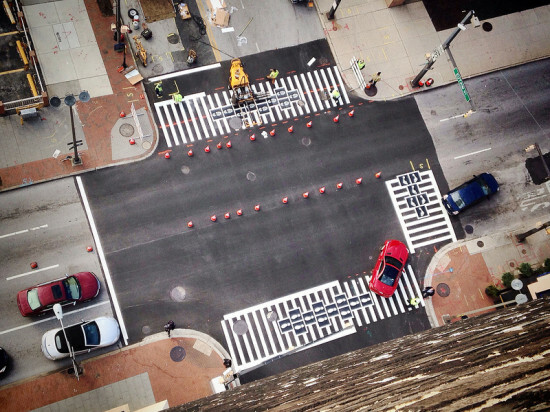 Other cities such as Milwaukee and Miami have altered their crosswalks to create inventive pathways, transforming them into black-and-white oversized piano keys, or multi-colored lines. 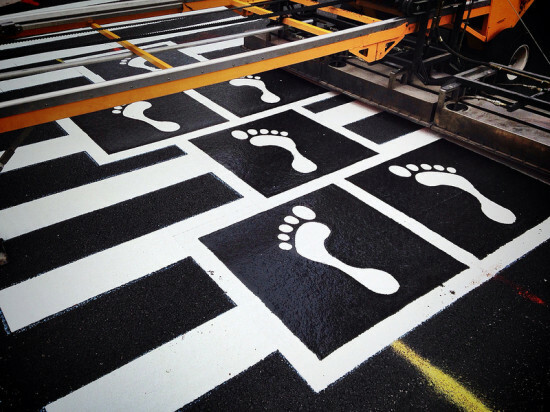 This artistic approach has been questioned for its safety, as playing a game of hopscotch in the middle of a busy intersection might not be the most responsible way to interact with traffic. The Baltimore Office of Promotion has assured skeptics, however, that they have worked collaboratively with the Department of Transportation who has approved the design for the project. Both agencies have said that the crosswalk is secure but that its users should remain mindful of the adjacent automobile traffic, stop lights, and other crosswalk signals.